Do you want to take your filming in Kenya? On this site allow us to show you all the details you may need to know before you start a filming session in Kenya. Kenya has always been a popular location for film production. Hollywood has a long standing affair with Kenya that dates back to the 1930’s. Many classic adventure films were shot on location in Kenya, including The Snows of Kilimanjaro starring Gregory Peck, King Solomon’s Mines with Stewart Granger and Mogambo featuring Clark Gable and Ava Gardner. Joy Adamson’s book Born Free was made into a hit movie filmed entirely on location in Kenya. George Adamson was to later take the trained lions that were used in the film and rehabilitate them into the wild. The film’s stars Virginia McKenna and Bill Travers went on to form a charity The Born Free Foundation which continues to support conservation work in Kenya. Hollywood’s greatest tribute to Kenya came with 1985’s Out of Africa. Adapted from Karen Blixen’s classic book, the film told the story of her life in colonial Kenya, with Meryl Streep in the lead role and Robert Redford playing her lover, Denys Finch Hatton. With stunning cinematography and a rich music score by John Barry, the film brought Kenya to life for audiences all over the world. A major box office hit, Out of Africa went on to win the Academy Award for Best Picture. In 1989, Kenya was the location for the filming of Bob Rafelson’s historical drama Mountains of the Moon. This epic film won great critical acclaim for its vivid retelling of the conquest of the Nile, and the great adventure of the Burton and Speke expedition. Filmed in diverse locations including Lamu, Hell’s Gate and Lake Turkana, the film shows Kenya at its best. Kenya has since served as location for several Hollywood blockbusters, including the sequel to Tomb Raider. In 2002 Nowhere in Africa a German language film about Jewish refugees struggling to create a new life in wartime Kenya was shot on location in Baringo, Bogoria and Mt Kenya. The film was a major success, winning over 14 international awards, including the 2003 Academy Award for Best Foreign language film. The 2005 box-office hit The Constant Gardener was also filmed on location in Loiyangalani, a small town located on the southeastern coast of Lake Turkana. 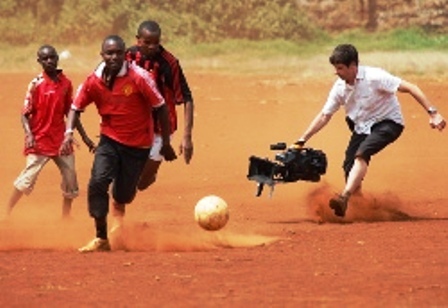 Kenya is a great destination for television wildlife productions. Many award winning wildlife series have been shot on location in Kenya by BBC Natural History, Discovery, Survival and other production houses. The Maasai Mara continues to be the backdrop for BBC’s popular Big Cat Diary, following the lives of the reserves predators.Maasai Mara, Kenya's world famous game reserve, was recently named one of the new Seventh Wonders of the World in a poll conducted by ABC Television's Good Morning America, and a broadcast on US morning television took this spectacle into millions of American homes, live from the Mara. Kenya hit the top of US TV ratings with the arrival of Survivor Africa. The third series of the hit game show was filmed entirely on location in Shaba Reserve in Kenya. For the producers, Kenya offered the perfect combination of beautiful locale, stunning wildlife and plenty of opportunity for adventure. Subsequent productions have included the German film 'Nowhere in Africa' which won 14 international awards including the Acemy Award for best picture, and was filmed on location in Nairobi, Mt Kenya and the Baringo/ Bogoria region. Kenya has two rainy seasons. The first is from April to mid-May and the second from mid-October through November. Even during the rainy season there is sunshine almost every day. The equator passes through Kenya and daylight hours do not vary much year round from 6.30am to 6.30pm. The Film Licensing OfficerMinistry of Tourism and InformationP.O. Box 74934 – 00200NAIROBI, Kenya. In order to obtain a license one should fill an application form accompanied by a copy of the script and a story synopsis. These should be sent to the Film Licensing Officer. Film Licenses for documentaries and commercials are issued within minutes of application. Applications for dramas and features films are processed in less than 48 hours of application. A nominal and non-refundable import charge of 1% or Kshs.30,000/= is charged, whichever is less, is levied on the total quantity of imported items per consignment. There are no restrictions in Kenya on how many expatriate crew members or artists may arrive in Kenya on a visitors pass prior to the Film Permit being processed. This cost approximately Kshs.2,000/=. A list of accredited Local Film Agents, who will facilitate location scouting; transport, hotel reservation, film licenses, shipping etc. can be obtained from the Film Licensing Officer on request. Kenya has a long tradition as a location for Hollywood productions and is a worldwide center for wild life documentaries. Local professionals, favourable climate and a relaxed friendly atmosphere have helped Kenya host an impressive array of international film makers who chose its remarkable locations for epics like: Mogambo, Out of Africa, Gorillas in the mist, Mountains of the moon, To walk with Lions, Nowhere in Africa, Survivor III series, Tomb Raider II, together with other countless television films and series. It is recommended, but not essential, that producers visiting Kenya on reconnoiters contact the Film Licencing Officer and provide details of their arrival. This advance notice allows for the provision of V.I.P. treatment at the Airport.